On Friday I snuck over the U.S. border. There’s no wall yet! Ha ha ha. Sorry, that’s my lame attempt at a little political humour. But I did go hiking on the Goat Haunt trail that travels along Waterton Lakes, into the United States to an outpost called Goat Haunt. ​Though I didn’t quite make it all the way. If you will recall, I did this hike years ago with my little brother Ben. For some reason I thought the hike was half as long as it was and we wound up bumming a ride off the Waterton Shoreline Cruise back to Waterton. This is such a great hike for someone who isn’t a hiker but has the stamina for a good long walk. It’s 13km each way (8 miles), and in the off season, you don’t have the option of taking the cruise one way. If it’s in-season, I would highly suggest hiking down there and then cruising up. It was an unbelievably warm day of +15C (in mid-November) and Samara and I packed away our coats within the first 10 minutes of starting up the Bertha Trail. You use the Bertha trailhead and just after the scenic viewpoint the trail veers left and you head down to Bertha Bay. Right after Bertha Bay is this cool short section of the trail where you walk along a rock cliff wall. It’s a little uphill here and you have to watch your step. After that little section it is smooth sailing for mile after mile. The trail meanders through the forest and will open up to little bays on the lake. At one point, the trail goes onto a gorgeous lakeshore beach. The very light wind still created little waves on the lake and it felt like being on the West Coast (almost). Halfway through the hike, we hit the cutline that was the Canada-U.S. border and Boundary Bay. There is a little back country campsite here which is adding this spot onto my ever-growing list. Shortly after the border was what I found the prettiest part of the trail, a raging river cutting through rock with a thin bridge above it. ​We stopped here for a while on the way there and back because it was such a gorgeous spot. In the background there is a waterfall and you can sit on the bridge and watch the water below your dangling feet. After this portion of the trail is a loooong section in the trees. Don’t be fooled when you get peeks of the Goat Haunt station on the lake because it looks close but the trail meanders through the trees for some time. It’s not an ugly hike by any means though! We kept our eyes open for any animal spottings and at one point we did hear a low moan, similar to a cow in the trees toward the lake. We never saw what made the sound but it kept us on our toes. We weren’t worried about bears as the berries along the trail were completely gone. We finally came up to Waterton River and what I feared came to light; the suspension bridge had already been dismantled for the season. ​It makes sense considering it’s November. I thought maybe if the tension was tight enough we could shimmy over the cables. After all, the water below was really deep so if we did fall we wouldn’t die. However, one step on the cable showed me how slack the cables were and though we were both tempted we opted out of trying. Neither of us had a spare change of clothes for a November dip. We sat on the edge of the river for lunch and spent quite a bit of time quietly eating and soaking in the sunshine. The water was so crystal clear I wanted to see fish but never did. After we were done we turned around and headed back. The way back seemed so much longer than the way there! Maybe it was because we were tired or it could be that we were racing a rapidly setting sun. We hit the Bertha scenic outlook at about 4:45 p.m. and the sun was clearly on it’s way down. By the time we got back to the car it was almost completely dark. 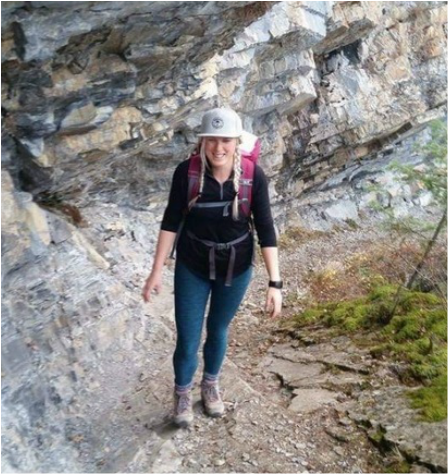 All this said – the reason we chose the Goat Haunt trail is because the Parks Canada website said they wouldn’t be opening the Cameron Lake Road until November 30th. When we drove by we saw it was open already! I think it’s snow time next weekend! Like my hat? You can get one for yourself HERE and twinsie with me!